We operate our elk, mule deer and moose hunts out of comfortable wall tent base camps in the Bridger Teton National Forest or from our drive-up camp on the upper Hoback River. We use horses and mules to transport our guests and their equipment from the trailhead to camp. This is a 4 mile horseback ride to the Mule Creek camp. Our camps consists of a spacious 16x20 dining tent and 14x16 guest tents. Tents have wood floors, wood stoves for heat, cots with mattresses and propane lanterns. We have tents for guides, cooks and horse tack, and a corral for the horses. We have running water piped into camp from a spring above camp. Hot meals are provided for breakfast and supper and a sack lunch is prepared every day. Things get pretty quiet when the food is put on the table as everyone digs in after a long day. We use big stout horses and surefooted mules to cover the large area included on our permit. We use these animals every day so it would be a good idea for guests to get a few rides in at home in the weeks immediately preceding your hunt to make this part of your trip more enjoyable. 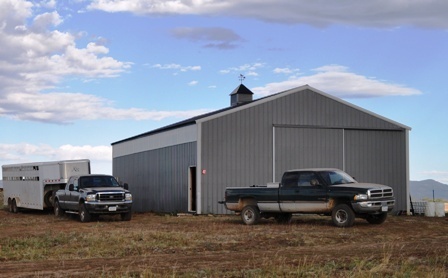 We have acquired a small acreage near our hunting operations in Wyoming. This parcel is at the base of the mountain, located just a couple miles off the main road on the way to the trailhead where we pack in to camp. This also is conveniently located only a few miles from the private ranch and BLM lands where we have antelope hunting. This property has a new 36 x 50 ft steel building that is insulated, has electricity, septic system, a well, wood stove, satellite, and gets good cell phone reception. We have 10 acres fenced and we can keep a few extra mules at the base of the mountain to be ready when we need them. We also lease another 40 acre pasture nearby and we can keep all the animals we need within a few minutes from the trailhead. We keep a deep freeze in our building to get your meat frozen as soon as possible. With the bear problems we have had, we try to get animals off the mountain within 24 hours of being killed and having a freezer here helps us keep your meat in good shape. You can package your meat in coolers to take home yourself or we have a local meat processor or can take your game to the processor in Jackson if you plan to be flying home with your meat.